The unique, three-volume Encyclopedia of Themes in Literature offers both a survey of literary themes and a collection of in-depth analyses of how these themes operate in individual literary works. Part I of this comprehensive set contains essays on 50 prominent literary themes, with each essay describing how the theme has evolved over time, how it relates to other important themes, and why this theme is powerful enough to recur so often in great literature. 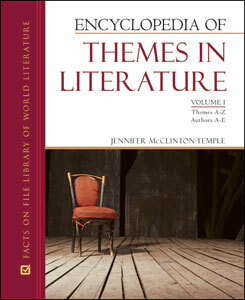 Part II contains essays on specific themes in more than 300 individual classic works of literature. Each section on a particular work contains a brief introduction to the work as well as three essays on different literary themes within the work. Themes covered include alienation, coming of age, heroism, innocence and experience, race, science and technology, and more. A helpful index and cross-references round out this invaluable set for students of literature. William Shakespeare's Hamlet (related themes: death, justice, love). "Best Bets for Student Researchers"